New Jersey is home to many different types of stinging insects. It is important to identify these infestations, especially for households with children, elderly, or those with medical conditions. The outside of the home, especially deck and patio areas, should be regularly inspected. Outdoor insect infestations can turn into troublesome indoor infestations. At Cowleys Pest Services, we have licensed, trained technicians with the proper protective equipment and the right products to treat infestations safely in Edison, Woodbridge, Lakewood, and nearby in New Jersey. Call 1-855-239-9059 or click below to schedule a free estimate today! "Will was very thorough and professional. Spent alot of time with us and..."
Will was very thorough and professional. Spent alot of time with us and really helped us. Really appreciated his time. Thanks! "Brian explained everything throughly and completely." Brian explained everything throughly and completely. "On time, professional, and good to deal with. These guys are good!" On time, professional, and good to deal with. These guys are good! Stinging insects are a serious medical threat. Their stings can cause a wide range of negative reactions. For some, a sting may cause localized pain, itching, redness, and swelling. However, for others, insect stings can trigger a life-threatening allergic reaction, or anaphylactic shock, requiring immediate emergency care. Removing stinging insects and nests can be dangerous work. Don't underestimate the injuries a swarm of angry bees or wasps can cause. Every year, hundreds of thousands of people wind up in a hospital emergency room because of severe reactions to insect stings. Honeybees and bumblebees are two of the most common social bees in New Jersey. Carpenter bees and digger bees are two of the most common solitary bees. Bees, especially honeybees, are valuable pollinators and are essential for many of our crops and plants. Honeybees are predominantly golden yellow with distinctive brown bands that stripe the abdomen. They have a thin oval-shaped body, about a half-inch long, and are covered with dense, short golden hairs. Honeybees are social insects that live in massive hives. The queen and the workers spend entire winters in the hive, making them the only social insects whose colonies can survive for many years. Honeybees are also the only bee that can sting once. Due to their barbed stinger becoming detached and embedded in the skin, they die immediately after stinging. Honeybee hives are made of rows of hexagonal cells known as honeycombs and are made from a wax material that the workers produce in their glands. Today, most honeybee colonies are managed by beekeepers, making wild honeybee hives a rare find. If you find wild honeybees on your property, the hive will likely be in a tree hollow or within the crevice of a rock. However, honeybees also colonize inside homes, especially in attics, chimneys, and inside wall voids. In New Jersey, it is illegal to kill honeybee hives or swarms. If you have any questions about properly identifying these bees or need of honeybee hive removal services, the experts at Cowleys Pest Services can help! Please see the New Jersey Beekeepers Association for more information. Bumblebees are one of New Jersey's largest bee species, measuring about one-inch long. They have a distinctive black and yellow striping, with an oval shape, and small hairs covering their bodies. Bumblebees are also social insects and frequently build their nests in underground burrows. Sometimes you'll find their nest above-ground around patios or decks and occasionally in attics or around the roofline. Bumblebees only become aggressive when they are provoked or if they perceive their nest is being threatened, buzzing loudly when disturbed. We usually treat bumblebee infestations when they nest inside a home or outside in a high-traffic area. Carpenter bees are commonly mistaken for bumblebees since they are both large in size and have similar coloration but often, carpenter bees lack the yellow striping and hair. Unlike bumblebees, carpenter bees are solitary insects. They mate in pairs, with the females tending to the young. The female lays her eggs and cares for the developing larvae in galleries, carving out holes in soft, often water-damaged wood. They are not aggressive or territorial and while males act aggressive to protect the galleries, they don't actually have stingers. The females rarely sting, unless they are stepped on or provoked. Like carpenter ants, carpenter bees can cause significant property damage, as the female bees drill perfectly circular ½-inch diameter holes into fascia boards, porches, decks, siding, sheds, and other wooden structures. This damage is often the most visible sign of a carpenter bee infestation, although another sign is "frass" or saw-dust residue. Carpenter bees do not consume wood like termites, rather, they destroy wood. Carpenter bees return to the same location year after year, building new holes and expanding existing galleries. Digger bees or ground bees are solitary, docile bees that rarely sting. When they do sting, a female sting is relatively mild, while males can't sting at all. Digger bees come many sizes and colors – they can be a mix of black, blue, brown, orange, and yellow. They are often shaped like bumblebees with some that look like yellowjackets, honeybees, and even certain types of flies. We primarily identify bees by their nesting behavior, so they are called digger bees for good reason. These bees nest in soil, digging tunnels to rear their young. Homeowners won't usually notice a few digger bees on their property. But, when hundreds infest, multiple nests can destroy a lawn. Digger bees are especially active in March through April. They are attracted to properties with just the right amount of sunlight, moisture, and soil density. If they do select your property, the infestation must be treated or the problem will continue to get worse every season. Social wasps and hornets are common in New Jersey, including highly aggressive yellowjackets, paper wasps, bald-faced hornets, and European hornets. The two most common solitary wasps are cicada killers and mud daubers. Yellowjackets are one of the most feared stinging insects, as they are a predatory wasp. They are black and yellow with a band pattern on their abdomens. They range from three-eighths to five-eighths of an inch long. Yellowjackets are a highly aggressive, territorial wasp that will not hesitate to sting if they feel threatened. Due to their scavenging behavior, they are often a problem in areas with food. Mature yellowjacket nests can house thousands of workers. While they are primarily ground nesters, building in rodent burrows or in hollow cavities, they can also build aerial nests in and around homes, especially in eaves, attics, and wall voids. These slender wasps have a thin waist, tapered abdomen, and long, trailing legs that extend out from their bodies. These wasps are usually brown with yellow or reddish markings. Paper wasps range in size, but they are no bigger than an inch long. These wasps are avid predators and feed on a variety of insects. They live in small colonies and build round, grey, papery nests with open cells that hang from a narrow stalk, resembling an upside-down umbrella. The wasps typically build their nests in well-sheltered spaces, including under eaves, roof peaks, porches, and decks. In the fall when temperatures drop, the females look for a warm location to overwinter and often try to enter our homes. If they do get inside, paper wasps will nest in crawl spaces, basements, and attics. Bald-faced hornets, despite their name, are technically wasps. They are black with distinctive white markings on their face and abdomen. These wasps usually grow to approximately three-quarters of an inch long and are particularly strong insects, capable of stinging through a layer of thick clothing. We often talk about wasps and hornets interchangeably, especially since they are both in the Vespidae family. Although, hornets aren't native to North America and the only true hornet in the United States is the European hornet. European hornets, also called the giant hornet or brown hornet, are large insects, about an inch long. As social insects, European hornets are highly territorial and will aggressively defend their nest. They typically have orange, brown, and yellow markings. Due to their yellow coloration, they are often confused with yellowjackets. Like yellow jackets, these hornets typically build their nests in holes or cavities, but they'll rarely build an aerial nest. Inside the home, they often nest inside wall voids, easily chewing their way through sheetrock. Cicada killers are black, yellow, and red, growing up to one and three-quarters of an inch in length, making them one of the largest wasps in New Jersey. Cicadas are solitary wasps that usually tunnel nests in bare soil. These wasps rarely sting people, but they are lethal to cicadas. Mud daubers are docile solitary wasps that rarely sting people. These wasps are up to an inch long and are thread-waisted. They are often metallic black or blue in color, with some showing yellow or greenish markings. As long as there aren't too many on a property, mud daubers are beneficial, as they reduce spider populations. In large numbers, these wasps can become a nuisance, as they often nest by mudding onto the walls of your home. Since their nests can be reused or taken over by more aggressive, dangerous wasps, inactive mud dauber nests should be removed. Homeowners can also control mud dauber populations by controlling their primary food source — spiders, doing so by caulking cracks and regularly remove spider webs. How Do Stinging Insects Enter Your Home? Bees and wasps enter homes through open windows or doors, cracks in siding or masonry work, and torn window screens. If you see them entering through a crack or crevice, don't seal their entry point before making sure they are eliminated or you may be trapping them inside your home. 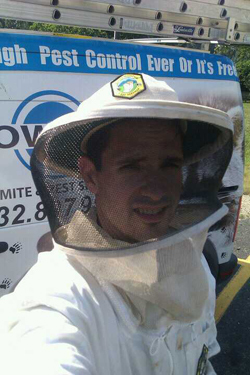 Avoid needless injuries, assure you're not destroying a legally protected honeybee hive, and completely rid your home of pests with the professionals at Cowleys Pest Services. Hazardous over-the-counter bee and wasp killing sprays only work if applied directly onto the nest. Meaning if you don't quickly and effectively destroy the nest, you are susceptible to life-threatening injuries. Our specialists can assess your pest problem and recommend viable solutions. To learn more about our bee and wasp removal services or to schedule a free estimate in Edison, Woodbridge, Lakewood, Trenton, Brick, Toms River, Old Bridge, Middletown, Princeton Junction, Piscataway, and nearby in New Jersey, call 1-855-239-9059 or contact us online today! Bees or wasps got you down? Find out more! Do you need more information about bees and wasps in New Jersey? Check out our in-depth bee and wasp technical papers by clicking the "Learn More" button!